Ranking the top-30 starting goaltenders is an arduous task. Some are good. Some are bad. Mostly they are voodoo and fluctuate more than the stock market. In the age of goaltending committees, it can be difficult – if not impossible – to forecast who really is the “starter” on a team by definition. Sorry in advance for ranking your favorite goalie so low. After winning the Stanley Cup in his rookie year, Ward has had an up and down career. He is making $6.7 million dollars this year and is in the last year of his contract. After a below league average .910 save percentage, this year he will be fighting for time against newcomer Eddie Lack. His job may be in serious jeopardy. Winnipeg has an undying faith in Pavelec, which is one of the most puzzling developments in recent management memory. He finally posted an above league average save percentage last year but will be pressured by Michael Hutchinson this year to perform. His leash will be very, very short. After a solid 13-14′ campaign, Scrivens had a bad year with the Oilers. Not a lot to be said other than the team was equally as bad at times. He has enough past performances that I believe he can bounce back, but much like Ward and Pavelec, he will be monitored closely and could see Cam Talbot take his spot. Bouncing around the league this summer, it was becoming unclear where exactly Jones would end up. He finally found a home in San Jose. Jones has shown glimpses of being a solid player but that was only in a backup role for the Kings. He will finally get the opportunity to be the man but has little track record of doing so. Howard has one of the odder career trajectories in recent memories. He has been selected for the Olympics before and seen deep playoff runs with the Red Wings but now will be competing for a job against Petr Mrazek. If he can put it together he should be a steadying force on the back end but it all depends on new coach Jeff Blashill and the direction he goes in. Arguably on the worst team in the league coming into this year, Smith is the only hope they have. He has had two consecutive years of below average play and should sustain that same play. No reason to see any improvement in the aging goaltender. Coyotes are in for a tough year. The former Ottawa goaltender is very similar to Martin Jones in that both have been backups and have been traded to teams that need a strong goaltender this upcoming year. Lehner will be playing for a much improved team that includes names like O’Reilly, Kane, Eichel and Franson. He should have a career-making year. The silver medal winner for team USA back in 2010 has seen a stark drop off after he was traded away from the Sabres. He will be playing for a Canucks squad that should be taking a step back this year. Miller had his worst year since 07-08′ in the league. Don’t expect much from him moving forward. Any other year and we probably see Dubnyk at the bottom of this list. Last year though we saw Dubnyk improve greatly and he was a Vezina finalist. Which Dubnyk will we see this year? It is tough to say but if past goalies of the Wild are any indication, he should keep up his sterling play. Hiller is the quintessential average player. Hitting almost all of the league average marks each year. He may end up losing his job this year to Karri Ramo but Hiller is the perfect average player to plug onto any roster. Much like Hiller before him he is also an average goaltender. Not bad or great, just right down the middle. He gets the edge in this case for being on the better team. He is the steadying force of an Islanders team that needed him desperately before last season. As you can tell by this point, we are at the average portion of the goaltenders. Andersen is part of a two-headed monster in net along with John Gibson. Andersen is the steady one between the two as Gibson has the higher potential and a wider range of play. One of the better duos in the league as they both are in the prime of their careers. Elliot has a tenuous hold on the position currently as Jake Allen is the goalie of the future. Elliot backstops one of the top teams in the Western Conference but has seen his numbers fluctuate over the years. If the Blues expect to progress farther into the playoffs this year it will be behind their goalies’ play. Elliot will need to be elite for them to move forward. Backstopping some bad teams in the past, Lehtonen has had some above average years in the past but is now going to be splitting time with Niemi. After last year, he is a little further down this list than he would be in past years. Age is starting to catch up with the netminder. Is he starting to enter the twilight of his career? Fleury is a Stanley Cup winner which can’t be forgotten but his well documented blunders come to the forefront of everyones’ mind. He had his best year since 07-08′ last year with a .920 save percentage which put him at 15th-best in the league. The Penguins are going to be one of the best teams in the league. Fleury is going to need to steer the ship for them to win another Cup. After splitting time the past couple of years with Robin Lehner, Anderson will be the number one goalie this year. He was tied for seventh in the league last year in save percentage, part of the reason why the Senators made the playoffs (that and the debut of Andrew Hammond). He has only seen 60+ games twice in his career, which may be troublesome as they don’t know what they have yet in Hammond. Will he be able to handle a bigger workload? Last year for Bernier and the Leafs was a rough ride as they saw themselves as a bottom-five team in the league. Prior to last year though Bernier had two above average seasons. The Leafs are in transition mode, but the player who stands to gain the most is Bernier who can firmly plant himself in the top-10 of league goaltenders. Bishop lead his team to the Stanley Cup last year and only had an average regular season. The year before that he had a borderline Vezina worthy season. Bishop eats up a lot of the net with his 6’7″ frame but at times can be seen as lackadaisical in net. His puck handling abilities are considered some of the best in the league since Martin Brodeur retired. After two above average seasons, the Avalanche have a lot to be thankful for with Varlamov in net. After two seasons as possession black holes, Varlamov has kept the team afloat. His save percentage only went down slightly last year and it resulted in the team missing the playoffs. It isn’t going to get any easier in the tough Central division. Crawford has to be one of the most frustrating goaltenders in the league as he fluctuates to below average to Stanley Cup winner from year to year. Last year he was sixth in the league in save percentage which firmly places him among the elite. Last playoffs though he was replaced in the first round by Scott Darling. Will the real Corey Crawford please stand up? At 36 years of age, Luongo is one of the older players on the list but he also has a very impressive resume. His best years were with the Canucks who have slowly but surely fallen apart since he left. He had an above average season last year and has been the backbone of a young Panthers team. Luongo is the ageless wonder and the Panthers better hope he can keep it up for them to make the playoffs. After his time with the Blue Jackets, many in the league had counted out the former Calder winner. Mason has come back into the picture in a big way with his play as of late. Mason was third in the league last year with .928 save percentage. You won’t find a more polarizing player on this list. He may revert back to his old ways but he may carry the Flyers into the playoffs. The two-time Stanley Cup winner is seen as one of the better goaltenders in the league but what the championships don’t tell you is that Quick has been average at times. His athleticism is unparalleled in the league but at times he uses it as a crutch for some poor positional play. Don’t get it twisted as Quick is a vital part of the Kings. When the Kings are possession wizards it allows Quick to at times get by on pure skill. We may be seeing a star coming into their own before our very eyes. After a solid regular season and a solid postseason, Holtby was rewarded with a long-term contract that puts a lot of faith in the netminder. The question for this upcoming year will be his durability. He played 73 games last year. Will he be able to replicate that pace? When Rinne is on you may not find a better goalkeeper in the league. He has had some durability issues in the past and he is also getting up there in age. Last year the team was seen as a success because of the pick ups they made in the offseason but it shouldn’t be overlooked that Rinne was tied for seventh in the league in save percentage. He has set the standard for Finnish goalies and because of it a goalie pipeline has opened up. Bobrovsky had himself a down year last year. He had two stellar years, one of which included a Vezina trophy winning season. The Blue Jackets have an average defense but “Bob” has saved them on numerous occasions. He will be called upon again to be their saving grace. No reason to think he won’t be up for the task. One of the consistently great goaltenders in the league. He may be the most underrated as well. He may very well be on the worst team in the league. There will be absolutely no way they make the playoffs but if they do? Schneider will be the reason. He has taken the number one goalie role in New Jersey and if early results are any indication he could become the next great Devils goaltender. Along with Schneider, Rask has been one of the most consistent players in the NHL. No one has been more important to the Bruins success recently than Tuukka Rask. He was tenth in the league last year in save percentage which puts him in the top third of the league. In 2013-14 he won a Vezina trophy and doesn’t appear to be slowing down any time soon. The Bruins are trying to rebuild on the fly, but are they going to be wasting Rask’s best years? Take Carey Price away from the Canadiens, what do you get? A non playoff team. That is how important he is to that team. You can’t place anyone else on this team and get a similar product. He won the Vezina trophy last year, which was no easy task as many strong candidates emerged throughout the year. More impressively he won the League MVP. The last time a goalie did that it was another Canadien – Jose Theodore. Price is a rare breed and for now looks like he could lead the Canadiens to the playoffs for years to come. It doesn’t get any better than Lundqvist, plain and simple. Although a Stanley Cup has eluded him thus far he has taken multiple Rangers teams to the Eastern Conference finals which is no small feat. What separates him from the rest of the pack is his sheer ability to bring teams up to his standard of play. Lundqvist is a generational player who won’t come along for another 10 or so years. 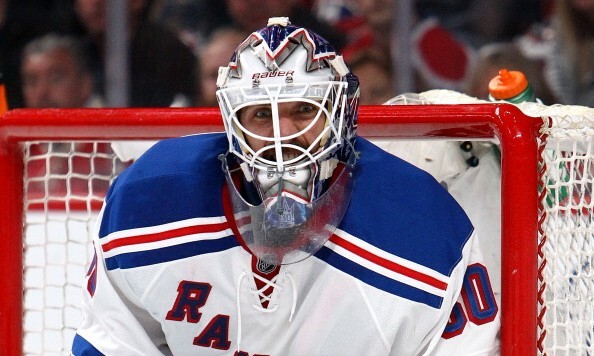 As long as Lundqvist remains superhuman, the Rangers will always make the playoffs and contend.